NASA's New Mars Lander - What's Next? 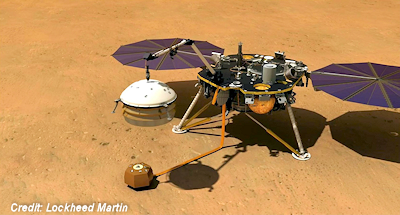 In this artist's illustration, NASA’s InSight Mars lander uses its robotic arm to cover the already-deployed seismometer instrument with a wind and thermal shield. InSight landed on the Red Planet on Nov. 26, 2018. PASADENA, Calif. — NASA's InSight lander has made it to Mars, but it'll be a while before the robot is ready to start its science work. InSight arrived at its new home yesterday afternoon (Nov. 26), acing a touchdown on an equatorial plane called Elysium Planitia. The lander will begin probing the Red Planet's interior in unprecedented detail — a few months from now. It'll take that long for InSight to deploy and calibrate its two main science instruments, a burrowing heat probe and a suite of super-sensitive seismometers.